Our President, Steve Farnham (left), has been speaking with consultants to discuss the future of Dorchester’s historic town centre and would like to ensure members’ views are taken into account. Therefore, we would be very grateful if you would take a few minutes to complete the short survey we have compiled as a platform to voice your views. 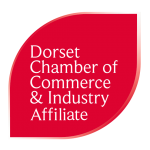 We would also like to use this opportunity to give you the chance to let us know more about your requirements regarding your Chamber membership. To access this short survey visit https://www.surveymonkey.co.uk/r/GRHZT5Z Thank you!